This paper presents a novel adaptive direct-sequence code-division multiple-access (DS-CDMA) slotted-ALOHA (S-ALOHA) packet random-access scheme with transmitter-based spreading codes for mobiles. It is aimed at improving throughput and message delay delivery when traffic load values below the saturation point of the conventional DS-CDMA S-ALOHA system are sensed in the channel. For this purpose, one mobile-station (MS) and two base-station (BS)-assisted algorithms are envisaged to control the change of the transmission rate according to the traffic load. These algorithms revealed that the optimum behavior, obtained using a Markov chain model, may almost be reached at a low-complexity cost. A traffic model based on a realistic statistical length distribution of the messages illustrates how the delay delivery can be greatly reduced with the proposed algorithms. Finally, the impact of forward-error-correction (FEC) coding on the adaptive system is also studied. 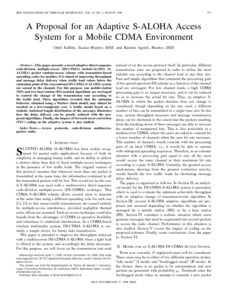 Sallent, J., Agusti, R. A proposal for an adaptive s-aloha access system for a mobile cdma environment. "IEEE transactions on vehicular technology", Agost 1998, vol. 47, núm. 3, p. 977-986.